A diamond encrusted teabag worth £7,500 has been created to raise money for a Manchester children's hospital. 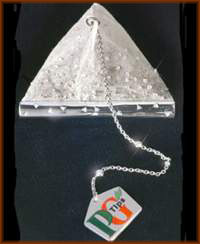 Jewellery chain Boodles made the pyramid-shaped bag to mark the 75th anniversary of Brooke Bond's PG Tips. Although it is covered in 280 diamonds, the inside still contains tea leaves so the owner could use it to make a brew. The bag will be used in a prize draw to raise cash for the Royal Manchester Children's Hospital, the charity chosen by workers at PG Tips in Trafford Park. One hundred 2.56 carat diamonds embellish its sides, another 100 are on the inside and 80 diamonds decorate the bag's white gold "string". PG Tips say it is the world's most expensive teabag. It will go on a tour of the country, stopping at seven shopping centres throughout March. Pete Harbour of PG Tips, said: "As it's our 75th birthday, we wanted to do something special to remind people just how much they love the great British cup of tea." The brand was launched in 1930 by Brooke Bond, who were then known as Pre-Gestee, and is now owned by food giant Unilever Bestfoods.